This article published by the Canada.GreekReporter.com and was brought to my attention by Helene Semanderes. Thanks Helene. The GCHP plans to be a continued repository for information, accessible for current and future research in broad thematic fields such as social, cultural, and economic practices of Greeks in Canada. 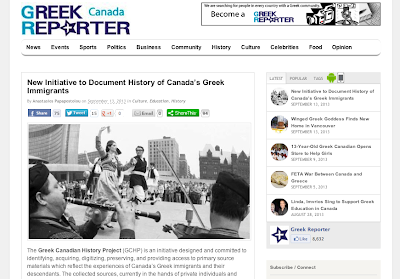 We invite individuals to contribute collections of papers, diaries, photographs, books, pamphlets, audio, video, and other materials that will be valuable for research of the Greek-Canadian past. ....."